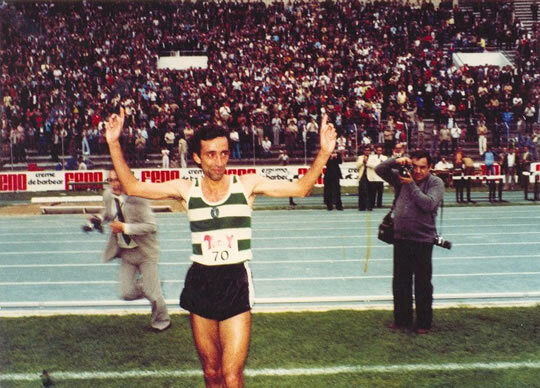 Thirty-one years ago, on July 2, 1984, Portugal’s Fernando Mamede ran 27:13.81 for 10,000m, breaking his own world record by nine seconds. For the 33-year-old Mamede, the record confirmed him as one of the favorites for a gold medal in the 1984 Los Angeles Olympics. It was also the most recent accomplishment in an impressive career. Mamede competed in three Olympics (1972, 1976, and 1984). In 1972, he competed in the 800, the 1500, and ran the anchor leg for Portugal’s 4×400 relay. I know of no other human being who has competed in both an Olympic 10,000m and 4×400. Mamede also set 27 national records, won 20 national titles at distances from 800m to 10,000m, set three European records, and three world records. He even won a bronze medal in the World Cross-Country Championships over 12K. But Mamede has been largely ignored by track and field history. Despite his many achievements, he has not been able to bask in the love and admiration of his countrymen. You can search the Internet in vain for tribute sites dedicated to Mamede. Something happened that changed everything. After winning his heat of the 10,000m in the Los Angeles Olympics, hopes were high for Mamede in the final. But after only a few laps, the world-record holder stepped off the track and abandoned the race. He wasn’t sick and he wasn’t injured. He was scared. Perhaps it was the weight of expectations, the knowledge that anything less than a gold medal would be seen as a failure. Perhaps it was something else. But what ever it was that caused him to step off the track, Mamede could offer no explanation. A year earlier, at the inaugural World Championships in Helsinki, Mamede had also won his heat, and then run terribly in the final, finishing 18th. Los Angeles seemed to confirm a pattern. Later in those games, Mamede’s countryman Carlos Lopes (second in Mamede’s WR race earlier that summer) won the marathon and became a national hero. Lopes had succeeded where Mamede had failed. Lopes became the hero, Mamede became something of an embarrassment. The following year, the World XC championships were held in Lisbon, Portugal. Once again, Mamede was a favorite. Lopes had been dealing with injuries and was not given much of a chance. But once again, it was Lopes who became the hero. The 38-year-old Lopes surprised and delighted his countrymen by taking the gold medal in what many have called the world’s most difficult race to win. The diminutive Lopes was called lion-hearted by the Portuguese press. Mamede faded to 11th and was called a disappointment. Later that year, Lopes would set a world marathon best of 2:07:12 and retire. At the World XC championships the following year, Mamede DNF’ed. For the second time on a big stage, he stepped off the course. The Portuguese press was not kind to Mamede. He was the target of threats and childish reprisals A sporting goods store that he owned was vandalized. More than two decades later, Mamede’s legacy is unclear. There is a track and field complex that he helped build and that bears his name in his native city of Beja. He works with young athletes. But otherwise, his career seems to have been forgotten or willfully ignored. It doesn’t seem fair, but such is the nature of athletic hero-worship. We want to identify with the winners, with those who have the physical and mental fortitude (and the good fortune) to succeed when the pressure is the most intense. If they can do it, perhaps we can do it too in our own moments of stress. We have little use for the athlete of exceptional talent and accomplishment who “loses his nerve” when it matters most. As observers, we can be cruelly dismissive of those who suffer psychological difficulties, who demonstrate great potential but struggle when the spotlight is on them. It remains a mystery why some athletes rise to the occasion and others are crushed by it. Why DID Fernando Mamede step off the track in the 10000 meter final in 1984? I once saw an interview with Moniz Pereira (both his trainer and Lopes’) and the old man just started crying (live on TV) when he was asked about Mamede. Among tears and a bit of shame, he mumbled “he was the best”. Mamede was quite different from Lopes. Lopes would set a pace and stick to it. He needed to keep gaining distance from the others along the race. As for Mamede, he was the guy who could explode in the final laps and win the race. Mamede was faster than Lopes but his mind was weak. People used to say that, in order to win, he had to see Lopes in front of him (there was a silent rivalry between the two of them). Mamede’s story is a sad one, indeed.